Summer is here. Yahoo. Time to play. Time to read. You don’t HAVE to read, you GET to read. These two 150 page novels, liberally sprinkled with black and white illustrations can keep younger middle grade readers reading this summer. 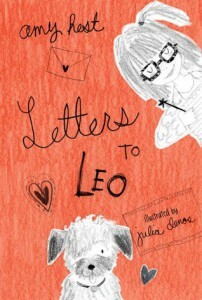 In “Letters to Leo” by Amy Hest (Candlewick 2012), 4th grader, Annie Rossi writes a diary to her dog, Leo. Annie is an opinionated, loveable 4th grader. She feels the injustice of the world in a high-spirited and entertaining manner. All those rules—no eating in the library, no drinking, no loud talking, no dancing, no dogs in the library. (She should come to my library (the Urbana Free Library) where we eat (in some areas) and on occasion entertain dogs by reading to them). On top of that Annie’s best friend is moving away. At times, Annie is angry and no wonder. 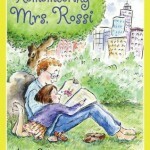 Her mom died in a prequel, “Remembering Mrs. Rossi” (Candlewick 2007), but it’s not necessary to read the earlier book to appreciate this light lovely romp. Usually, Annie’s exuberance trumps her low spirits and even her old professor dad (he’s 40) is cheered. Julia Denos’ zippy child-like illustrations add to the fun of this book. 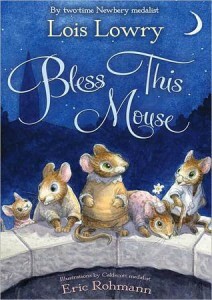 “Bless This Mouse” by (Newbery winner) Lois Lowry (Houghton 2011) and illustrated by (Caldecott winner) Eric Rohmann is written in a slightly old-fashioned style and could be a classic-in-the making. Hildegarde, Mouse Mistress of St. Bartholomew church, must keep the church mice safe. They know the Great X is coming. The adept reader will discover on his own that the X is the Exterminator—Pest Control—No-More-Rodents. Not only is the Great X on the way, so is the Blessing of Animals and that will surely mean cats right inside the church. Alas, dangers abound. Clever Hildegarde has a master plan. She also has a nemesis, Lucretia, who wants Hildegarde’s job and high status. In the end Lucretia gets her come-uppance, but Hildegarde will be more-than fair. Ignatius, an erudite and worldly mouse, advises Hildegarde, as does Roderick, who has a crush on Hildegarde. The plot includes brave rescues from a mouse’s point of view, keeping it fun and light hearted and gently Christian. An audio version is melodramatically but nicely read by Bernadette Dunne. Read read read. And parents, read to your children even if they can already read themselves. They’ll remember it forever. AND FURTHERMORE: (This is the part that’s not in the Champaign Urbana News Gazette) My mom used to read to my sister and me after dinner, when we were in elementary school–books like Charlotte’s Web and Hitty, Her First Hundred Years, (Monica, what else?) and my brother, a good deal older and in high school would come out of his lair (his bedroom where he studied physics and did chemistry experiments), come downstairs and stand in the doorway and listen to my mom read. She was a great reader. Reading great books.